At the start of this week, our year group went to Carlingord Adventure Centre in Co.Louth. We left Celbridge early in the morning (around 7:00 a.m) loaded with all our sweets and our wellies, ready to get stuck in to all the activities at Carlingford! When we arrived at Carlingford, after a bus journey full of song, we were greeted by the friendly staff there and got sorted into our rooms and activity groups! We then headed off to our first activity, kayaking. We paired off and set off into the water, headed for an underground waterfall across the Lough, there was a myth sorrounding this waterfall that if we kept our head submerged under it for 10 seconds we all would live a day longer! Kayaking was great fun, we somehow managed to stay in the kayak and not capsise but we did get soaked, i must admit we surprised ourselves on how good we were at it, I thought we would be miles behind the others but it turned out we were quite the opposite! For the second part of that first day we took part in the High-Ropes challenge and 'Zorbing'. We walked for 20 minutes down the road until we came to an open field, I the noticed all the wooden poles and ropes suspended high above the ground, I knew what we were going to be doing would be scary! We got suited up in all the safety gear and began our 'High-Ropes' activity. I was first out of our group to begin climbing up the 35 ft pole, but don't worry I was safely secured to a harness attached to my other team-mates on the ground! When I reached the top of this pole there was a small 'pizza-box' sized tile, which I had to stand on, I had to stand in a corner of the tile so that I could leave room for three other girls to stand on it also! Shauna was next to climb the pole to the top, I was shaking so much the pole was wobbling, once Shauna reached the top I began to calm down as I knew I wasn't alone up there! After Shauna, Sarah and Roisin climbed to the top! 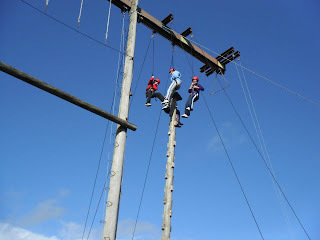 Once we were all up there, we had to make a 'star' shape by holding each other's hands and leaning back off the pole, we had to trust each other! It was so scary but we all gave it a shot anyway although I'm pretty sure the shape resembled nothing of a star ! Dangling 35ft up in the air! When everyone was finished with the High-Ropes, we all headed over to do 'Zorbing'. 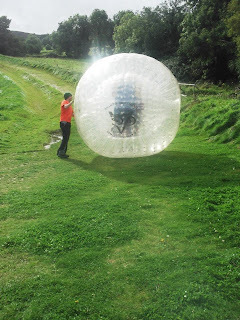 I had no idea what zorbing was and had never heard of it before, but when we arrived i quickly caught on! There's a picture below of what we were doing! For the whole journey down the hill in the 'zorb', both Chanice and I were screaming and laughing at the tops of our voices! Zorbing was so much fun, everyone enjoyed it! Later on after dinner, we all put on our wellies and head up the nearby hills to a forest where we were doing a blind-folded late-night walk! In this activity, we all put blindfolds on and placed our hands on the shoulders of the person in front of us. This was another trust exercise as we were all relying on other people to guide us safely around all the obstacles and trees in the forest. After our walk we had all worked up an appetite and decided to head down to the Chineese take-away! The poor man working there had probably never seen so many people packed into that waiting room before! After a long wait, our take-away was finally ready and everyone headed back to the centre to eat and settle down for the night, we all went to our rooms around 11:00. We were all so tired after a busy day of activities but also ready for more the following day!